Nathan Jones: There are many huge evidences that prove God's existence for people to use in trying to grow in their faith and dispute the Skeptics. Are there other evidences that people can know God apart from the Bible then that you'd like to highlight? Carl Gallups: You mean, if there are ways that people can come to know God, even if they've never had a Bible? Nathan Jones: Yes, they've never had a Bible. They are living in some rainforest somewhere and they've got to come to know God in order to be saved. Is there a way possible? Carl Gallups: Yes, and as a matter of fact, I've got a chapter in my book entitled something along the lines of, "But What About Those Who Have Never Heard?" Nathan Jones: Yes, that's a huge and complex question people are always asking for an answer to. Carl Gallups: So, let's say this happens to a person living in the Amazon that a missionary has never visited nor opened a Bible and read the Gospel to them? That's a wonderful question, but that question is based upon a couple of false premises. The first that comes to mind, it is based upon the premise that all men are innocent from the beginning and therefore if they don't hear the Gospel they are sent to Hell, and that somehow is unfair. We know the Word of God says that we are all born into sin in the first place. Are their ways that someone can come to an understanding of God apart from the Bible? Well, we know that the preaching of the Gospel is God's main purpose, His main way, His main design, for men and women and boys and girls to know Him. However, we also know from that Word what Romans 1 says, in that we are all without excuse. The man in the Amazon jungle is without excuse because of the things that have been created. For, by the things that are made, we know that there is a God and we're not Him. Nathan Jones: General Revelation that is called, right? Carl Gallups: General Revelation, yes. The complexity of Creation is what we begin with in understanding God apart from the Bible. I also think about Moses in the backside of the desert. God set a bush on fire for him and said, "Come here, Moses, I want to talk to you." "Who are you?" Moses asked. God replied, "I am the Lord." The Apostle Paul was on his way to kill Christians in the name of God. While outside the Temple of God the Pharisees were thinking they had done God a favor by crucifying the Son of God. Paul was a Pharisee, and in just a few years later he was helping to stone Christians. He was on his way to kill more Christians. How's anyone going to reach him for Jesus Christ? Well, the Lord Jesus appeared to Paul, struck him blind, struck him down on the road. Paul became one of the greatest evangelist and missionary of all time. Nathan Jones: That is Special Revelation, which can be considered the opposite of General Revelation? 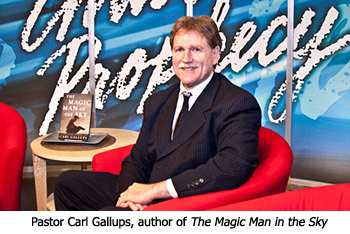 Carl Gallups: Yes, indeed, Special Revelation. There are also angelic revelations. Here's the bottom line that I come to in my book — God can reach anybody, anytime, anyplace, and anyway He desires because He is God. In the end of all things, we leave reaching the seemingly unreachable in His hands. Our responsibility is to take the Gospel to the ends of the earth by every means that we have. But, for somebody to make the argument, "What about the person who never hears you preach and so that's not fair," well I respond, "God's not limited by our limitations." That's my quick answer to that complex question. In the nineth segment of our interview with Pastor Carl Gallups concerning the existence of God, he'll answer that difficult question, "How can there be a God with all the evil and suffering in the world?"